Like the Hatters, Bury have had a November to remember in front of goal. It started in style with a wonderful 4-1 win at Macclesfield, and the Shakers followed that up with a 5-0 thumping of Dover Athletic in the FA Cup. They could only manage three in the 3-1 Checkatrade Trophy win over Fleetwood before dismantling Stevenage 4-0 at Gigg Lane. Ryan Lowe’s side dropped their only points in a 2-2 draw at Camrbidge, but were back to their prolific selves against Cheltenham, hitting four more in a 4-1 win to make it 22 goals in just five matches. It hadn’t looked quite so good at the start of the campaign with a 1-0 win over Yeovil, followed by five games without a victory. They then managed three league wins a row though, before losing to Carlisle, as although another fine triumph at Colchester followed, the progress was stunted by three successive draws and one league win in six. However, the win at Moss Rose has breathed fresh life into the Shakers’ challenge as Lowe’s team are now looking well equipped to mount a serious assault on regaining their place in the third tier of English football once more. Team news: Kazenga LuaLua is a slight doubt for the Hatters after missing their last two matches, while Luke Berry is back in training, but may not be risked yet. For Bury, striker Jermaine Beckford (knee) remains the only long-term absentee. Top scorers: Hatters – Elliot Lee (10). Shakers – Nicky Maynard (8). Man in the middle: Thomas Bramall - taken 21 games so far this season, keeping his cards in his pocket for the majority, with 39 yellows and two reds, although 15 of those bookings have come in three matches. 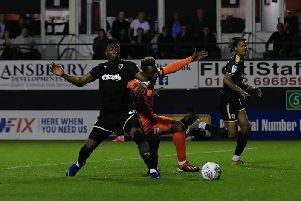 First Luton game as he was promoted from the National League last term, while in the 2016-17 campaign did send off a player in four successive matches. Assistant referees are Christopher Ward and Alix Pashley, with the fourth official Dean Watson. In charge: Ryan Lowe – 40-year-old was a proven striker in his playing days, racking up over 200 goals in his near 700-game career. Started out with Shrewsbury Town in 2000 and had spells with Chester City, Crewe Alexandra and Stockport County, before moving to Bury in June 2009. Became something of a legend at Gigg Lane, breaking a 53-year record when he scored in eight consecutive league games, before moves to Sheffield Wednesday and MK Dons followed. Headed to Tranmere in June 2013, returning to Bury the following season, and was then back at Crewe in November 2015. Rejoined Bury for a third spell as player-coach in January 2017, appointed caretaker boss in October after Lee Clark was sacked. Oversaw six games until Chris Lucketti came in, but once he was dismissed in January 2018, Lowe took over again and was named permanent manager in May. View from the opposition: Ryan Lowe talking to the club’s official website: “It’s set-up to be a great FA Cup tie. I think that Luton are probably one of the best teams in League One, I think they’re going to be right up there. “Nathan Jones has done a fantastic job, they’ve got some good players and they’ll probably say the same about us. “The only thing that separates us for me, is the league. They’re in League One, we’re in League Two – we’ve gone down, they’ve gone up. “We’re probably underdogs in a way; there’s a lot of people terrified of playing them, but I’d like to think we’re a different test – we’re a different animal compared to last season. “We just look at it as another game, we’ll respect them, their fans, their club, because they’ve got a great following. Friendly faces: Town striker Danny Hylton joined Bury on loan during the 2013-14 season for three months, making 11 appearances and scoring twice in the 1-1 draws with Bristol Rovers and AFC Wimbledon. Played for both: Marc Pugh – winger who started life at Burnley, before he spent a season just over a year at Bury between March 2006 to May 2007, playing 47 times, scoring five goals. Joined Shrewsbury and was loaned to Luton for a month in the 2008-09 campaign, making just the four appearances for the Hatters in League Two. Went to Hereford next, joining the Bulls permanently in July 2009, before Bournemouth paid £100,000 for him the following season and has played over 300 times for the now Premier League Cherries. One to watch: Nicky Maynard - prolific striker began his career with Crewe, where he scored 35 goals in just 67 games, to alert clubs higher up the footballing ladder. Earned a 2.25m move to Bristol City in July 2008, netting 46 times in 131 for the Robins, which saw West Ham splash out £1.65m for him. His stint at Upton Park times didn’t go quite as he wanted, joining Cardiff for £2.5m in August 2012. Also struggled to be a regular with the Bluebirds, as had a loan move to Wigan in January 2014. Joined MK Dons in September 2015 as the goals dried up, scoring just nine in 72 appearances as he went to Aberdeen in July 2017, where he failed to net in 20 matches. Back in England with Bury in September 2018 and has quickly rediscovered his scoring bots, with eight goals in just 12 matches for the Shakers. We’ve got form: The Hatters have a mixed record at Gigg Lane in their history since games started with an FA Cup first 2-1 defeat in January 1923, Alf Tirrell on target. Since then, Luton have won seven, drawn four and lost 11 of their 22 visits, scoring 30 goals and conceding 39. In the FA Cup, they have made one more visit, held to a 1-1 draw in a second round match back in December 2014. However, Daniel Nardiello ensured the game went back to Kenilworth Road after scoring a last gasp leveller. Town came through in the replay, thanks to Luke Rooney’s 48th minute goal setting up a third round tie with Cambridge that Luton lost 2-1. Last time out: Luton were beaten 1-0 on their last visit to Bury, that a League Two clash in March 2015, as Tom Soares netted the only goal of the game on nine minutes for the hosts. Hatters: Elliot Justham, Michael Harriman, Scott Griffiths, Steve McNulty, Luke Wilkinson, Jonathan Smith, Jake Howells (Nathan Oduwa 46), Luke Guttridge, Cameron McGeehan, Jayden Stockley (Mark Cullen 59), Elliot Lee (Alex Lawless 46). Subs not used: Craig King, Fraser Franks, Andy Drury, Shaun Whalley.